For those who trade volatility for a living – this is starting to feel a lot like the dog days of mid-2014. Two years ago, the markets were overly complacent. And we’re not just talking the VIX and stock market volatility. It was everywhere – energies, Currencies, Grains, as well as stocks and bonds. We wrote about the coiling of volatility, wondering what was going to uncoil all that pent up energy and make the cork pop. A couple months later, we knew the answer was crude oil and its major sell off. Fast forward to today, and it’s easy to see that Managed Futures/Global Macro managers are chomping at the bit to see a volatility uptick. “Managed Futures Thrived from Brexit,” but since that, it’s been a steady diet of losses as volatility has been sucked out of just about everywhere once again. Nowhere has that been clearer than in currency volatility, where Bloomberg’s posting of JP Morgan’s Global Currency Volatility for the year reminded us of more than a few hedge fund equity curves for 2016. 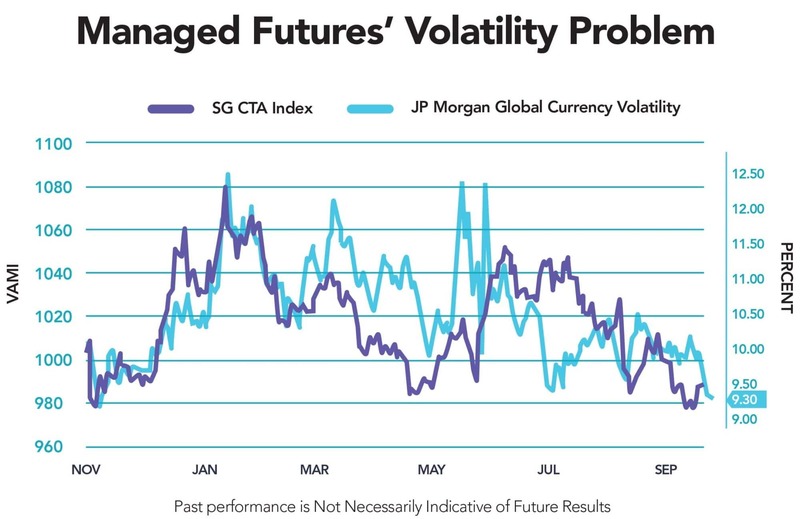 Overlaying the SocGen CTA index on top of this currency volatility chart, you can see the high correlation between managed futures returns and the level of volatility in Global currencies. The question now is whether this is a new normal (as dangerous of words as you’ll find in the investment space), or whether we’re simply trading no risk (volatility) now for increased risk later. Brexit surely seemed like the event that would bring volatility back in a big way, but that was a short-lived spike as our volatility panel discussed. In the end, this type of market contraction – both in prices and volatility – naturally leads to a counter move where there is a breakout from those ranges – either up or down. Whether the catalyst for such breakouts is the election in two weeks time or the next Fed meeting, something’s needed to shake these markets out of their extended nap. P.S. 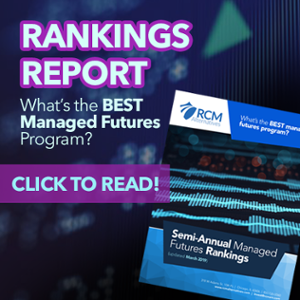 – One silver lining for managed futures may be the uptick in the U.S. Dollar Index (up 3% in October), off of a plummeting British Pound and Euro. This can work as a standalone trade, or assist in pushing trends elsewhere as most all commodities are priced in U.S. Dollars.